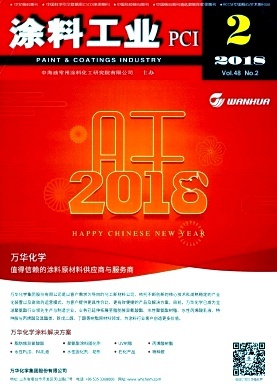 Research on COD Removal from Waste Liquid of Waterborne Paint Using Nanofiltration-Reverse Osmosis Membrane Separation Huang Chunlin;Lu Zhihao;Sun Xianbo;Shanghai Emperor of Cleaning Co.
Study on the Corrosion Resistance of the Bottom Coating of Steel Pop Cans Miao Ce;Cheng Zhongping;Shanghai Jianke Technical Assessment of Construction Co.
Synthesis and Characterization of Self-Repairing Microcapsules in Anticorrosive Coatings Based on Hexafunctional Isocyanates Kong Fanhou;Xu Weichang;Li Lei;Yang Chengling;Cao Ying;Liu Ge;Song Zhaoyi;Shenyang Research Institute of Chemical Industry Co. Preparation and Properties of Polyester Resin for High Solid Coil Topcoat Hua Tao;Gan Chongning;Jiang Xu;Chang Xiajun;Yuan Hao;Li daming;CNOOC Changzhou Paint and Coating Industry Research Institute Co.
Study on High Hardness and High Gloss Thermoplastic Acrylic Resin for Plastics He Wunan;Zou Faze;Tan Zhengbing;Zhongshan Just Paint Manufacture Co. Preparation of Waterborne 2K PU Wood Coatings with Visual Gelatinization Gao Jiandong;Li Si;Xu Aiying;Nipponpaint China Holdings Co.